Pro-Palestine protest outside of AIPAC annual convention in D.C. 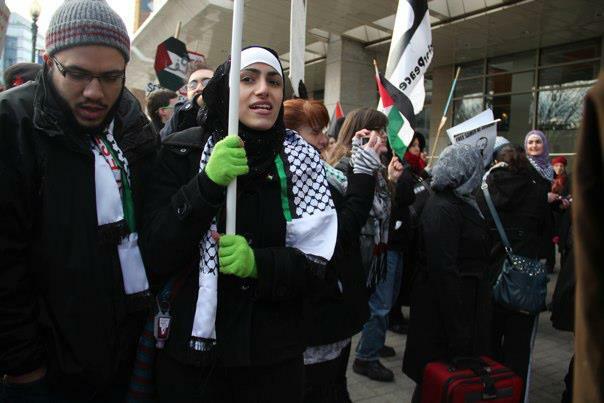 Protesters at an action earlier in the week organized by the Expose AIPAC Coalition. Chants of “Free, Free Palestine” rang through the night air and Palestinian flags were raised on Monday, March 4 as protestors demonstrated against the American Israel Public Affairs Committee (“AIPAC”) during the gala portion of their annual convention. Held at the Washington Convention Center, the event also drew dozens of U.S. Senators and Representatives eager to show their support for Israel. The politicians and convention delegates were met by a militant rally immediately outside the convention center’s main entrance, which was organized as part of a series of actions called by the Expose AIPAC Coalition, and was attended by many organizations, including CODEPINK and the ANSWER Coalition. A slide show projected against the façade showed Israeli war crimes as the demonstration combined speak outs from participants with chants, including “No Justice, No Peace” and “Not Another Nickel, Not Another Dime, No More Money for Israel’s Crimes.” Speakers described Israeli theft of land through illegal settlements and torture in Israeli prisons, and expressed support for the growing Boycott Divestment Sanctions (BDS) movement against Israeli policies. The annual convention comes at a sensitive time for hardline supporters of Israel. Desperately needed social programs, already severely underfunded, face deep cuts as a result of budget sequestration. The city of Detroit has gone into “receivership,” with a financial manager given virtually dictatorial powers to slash services. Against this scene of hardship, AIPAC is lobbying to ensure continued funding of Israel, which currently includes an annual $3.1 billion in taxpayer money for the Israeli military.